 UK / USA  1983  116m   Directed by: Peter Yates.  Starring: Ken Marshall, Lysette Anthony, Freddie Jones, Francesca Annis, Alun Armstrong, David Battley, Bernard Bresslaw, Liam Neeson, John Welsh, Graham McGrath, Tony Church, Bernard Archard, Belinda Mayne.  Music by: James Horner. The planet Krull has been invaded by the evil monster The Beast and his army The Slayers, two rival kingdoms have formed a alliance, as Prince Colwyn, the son of King Turlord marries Princess Lyssa, daughter of King Eirig, where Prince Colwyn and Princess Lyssa's marriage will unite the two kingdoms and both Colwyn and Lyssa will rule the lands of Krull. But during the wedding, The Slayers attack and Lyssa is kidnapped. Setting out to rescue Lyssa, Colwyn joined by a fellowship companions: the Seer Ynyr, a band of escaped convicts led by Torquil, Rell, a one-eyed giant, Ergo, a cowardly magician, Emerald, a blind Seer and a young boy named Titch set off in search of The Black Fortress where Lyssa is being held captive, where The Beast intends to marry Lyssa in it's evil goal to rule Krull along with many other worlds. Pauline Kael infamously wrote of Star Wars, "it's an epic without a dream." 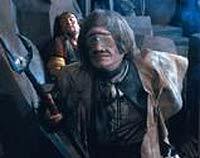 While inappropriate for Lucas' 1977 film, it certainly holds true of Peter Yates' Krull, a nonsensical sci-fi fantasy hybrid which indulges in the superficial aspects of both genres without tapping into the common heart of either. We start with a Stars Warsesque opening where a vast ship moves across the frame. A ship that much resembles a strange rock formation like, say, a mountain. And while this mountainspacecraft lands, a voice-over invokes the fantasy genre with a prophecy of a Prince who shall defeat the intruders, slay the beast, save his bride, and their son shall rule the galaxy. Thus begins the formula: Prince + Mentor + Princess to be Saved + Ragtag group of unlikely allies + Monstrous Villain = Fantasy (throw in rotoscoped lasers, and voila: Sci-fi.) Now, I don't have any problem with said formula if said film can convince me to suspend my disbelief for it. Who is the Prince we're supposed to follow? Who is the Bride he's supposed to save? Why should I give a damn about them? I do not need (nor do I expect) full blown character bios and witty Shakespearian asides, but at least give me interesting little character quirks to separate these people from every single bland-to-mediocre fantasy novel, every single fantasy video games, and every single D&D campaign I've ever played. Give me characters with conviction. Unfortunately, everything exists to satisfy the formula, and the movie almost never takes a step further. The prince embarks on his epic quest to gain the glaive, find the seer, track down the fire mares, and engage the black fortress with an adventure loving smile ... nevermind that the villains have his bride and are doing God knows what to her. The mentor imparts no wisdom upon the young hero, rather, exists to connect the dots and keep the plot moving by informing everyone where to go next. When the villainous slayers die, a strange creature bursts from their skulls and burrow themselves into the ground, but no one questions what they are or why this happens. The beast kidnapped the young bride for the sake of kidnapping the bride (why the hell do they care about this planet to begin with, anyway?). Yates introduces a Cyclops, and sets up a potentially magnificent pathos -' that these creatures long ago made a pact with the Beast to see the future. Betrayed, now all they can see is the moment of their own death. In passing, this Cyclops speaks of his curse, but the film never explores it. "I must stay here," he informs while everyone else rides on to the black fortress, but never does he state why he must stay there. Then a few minutes later, we see him riding to the rescue for an anti-climactic climax that carries the weight of a man deciding on decaf seconds before the 711 clerk pours his coffee. The only character with any development and anything resembling pay off lay in the comic relief. Yes, Ergo, who describes himself as "Ergo the magnificent! Short in stature, tall in greatness, narrow in focus, and wide in vision." Early in the film, we see the extent of his magic as he shuffles through scraps of parchment, mumbling some arcane words, and presto! He magically changed ... himself into a goose. Over the course of the movie, he buddies up with a depressed young boy who lost his father figure. The boy says if he could have anything in the world, he'd want a puppy. So on the road, Ergo turn himself into a cute little beagle, and the boy is delighted. Later on, the two are trapped (inexplicably abandoned by the Prince) with Slayers approaching. Ergo changes himself into a tiger, and strangely steals the sympathy right out from under Prince-what's-his-name who left them both to die. Yes, the Prince flat out abandoned his companion and a small boy, and the scene doesn't bother conveying a sense of loss. The prince starts to go after them, but when it's apparent he'd be trapped with them he hops out of the hole so fast you can almost hear the MST3K crew throwing out the line, "Eh, screw this!" Is this prince going to tackle rescuing his princess with that level of commitment? What about their marriage? Some happily ever after. Since the film fails so epically on the character level, one can't help but notice the premise's absurdity. Medieval knights will fend off enemies capable of space flight. The bad guys, the Slayers, slowly approach with spears that fire off long range energy projectiles, and then when close these stiff and stilted creatures then use their spears as melee weapons. Why not just stand back and fire until everything is dead? And why have they mastered spaceflight, but not -' I dunno -' cannons? Heat rays? Atomic and biochemical weaponry? 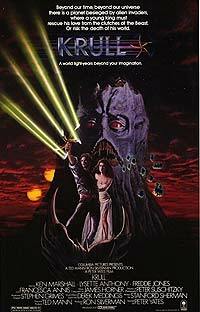 That's not to say Krull entirely lacks any redeeming features. Quite the contrary, when the character's actions take a backseat to show off Peter Suschitzky's breathtaking photography of magnificent landscapes, and when the lifeless dialog yields to James Horner's primitive (but charming) score, Krull stands with the best cinematic experiences. It's strangely ironic that Krull is strongest, most riveting, and most inviting when the characters shut up, fade into the background, and just move from point A to point B. Review by jaywolfenstien from the Internet Movie Database.